Everglades National Park preserves the largest subtropical wilderness in the United States. Saving this national treasure yields both environmental and economic benefits – and only thorough analysis can fully capture the value. 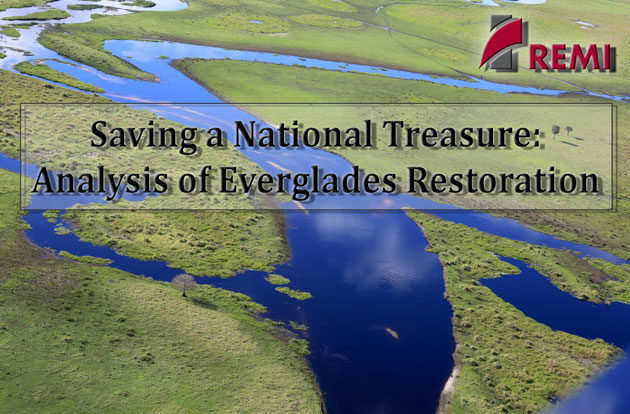 Richard Weisskoff, Ph.D. started evaluating the potential economic impact of the federal government’s initial $3.5 billion plan to restore the Everglades on South Florida in 1997. Years later, Dr. Weisskoff, who is currently a Professor and Chair of the University of Miami’s Department of International Studies, assessed the success of forecasting impacts through economic modeling. His work provides insight into how policy makers can evaluate other major restoration projects. We cordially invite you to a guest webinar presentation by Dr. Weisskoff on Wednesday, January 31st from 2 to 3 p.m. EST on his 2017 paper, “Never Look Back: A Twenty-Year Perspective on Everglades Restoration.” For this webinar, he will review long-term forecasts completed in the early 2000s with the help of REMI modeling software. Dr. Weisskoff will describe his methodology and then compare water usage and population forecasts with actual records.